The bidet is a type of bathroom fixture which looks like a regular toilet but it is positioned in a rather low fashion. It is used chiefly to wash and clean the user’s private parts. The bidet was first invented in the 17th century and is attributed to a furniture maker of French descent with the name of Bide. The bidet was produced by Bide for the royal family of that time. However, some experts say that the bidet was first created by another inventor named Bougardeux. Regardless, the bidet and its spin-off products like the bidet toilet seat are innovative creations and have since made their way into lots of restrooms all over the world. In Japan in the 60s, the bidet was given an upgrade and soon enough the paperless toilet was launched. This was a type of bidet wherein the nozzle is fastened to the toilet and a drier is also added to it. 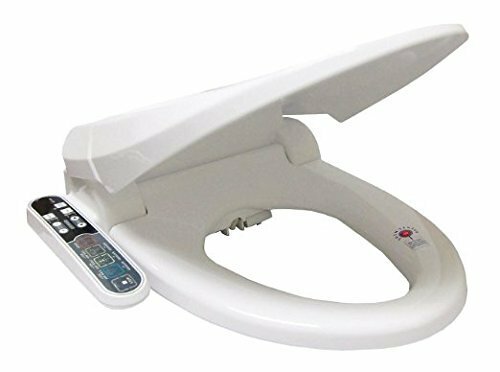 Countries in East Asia like Japan and Korea have a good number of homes which have this type of bidet style. They are often seen in hotels and in several public convenience locations. For better hygiene, this kind of bidet is also used in lots of hospitals. Toilet and bidet combos, as well as bidet seats which can be put in the toilet seat, are sold in lots of stores in Japan, Turkey and the US. The bidet seat includes at least one rod or wand which is a bit thicker than a pen. This rod or wand lies within the seat when it’s not being used and comes with a self-cleaning feature which operates after each use. To clean the front or back, the fixture comes with nozzles as well. The wands will spray water by means of those nozzles to clean target areas. Lots of models sold on the market right now come with several nozzles which are designed to spray water in a particular manner and boost efficiency for a variety of washing options. For elderly persons who use bidets, there are models which are designed to fit toilet seats which can be lifted or elevated. Bidet seats are also available with lots of attachments like jet remote controls and dryers. There are now models that come with sprays, temperature control, and water pressure. The ones with sprays are best for individuals who have decreased mobility or people who need help in the bathroom. If you are new to the whole bidet fixture thing, you have to take into consideration a number of factors in order to choose a product that will perfectly cover your needs. 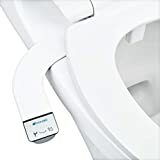 First, you need to keep in mind the main kinds of bidet toilet seats, which are the 2-piece elongated type, the 1-piece elongated, the 1-piece round and the 2-piece round. It is also important to make sure that you are familiar with the toilet’s design so the seat will fit on it easily. As soon as you know the kind of toilet you have at home, then the options that you will be looking at will depend on the features you prefer plus the budget you have allotted for it. Electrical bidets come with a heated seat. This heated seat gives off a level of comfort which is welcome during the colder months of the year. The majority of heated seats provide users with the ability to manage the temperature of the seat. The temperature ranges from 93-104 degrees. It is a great feature for locations with colder climates and for individuals who cannot stand cold toilet seats. If you are not fond of the loud noises released by toilet seats being slammed shut, then you need a hydraulic seat and lid. Lots of complete function bidet seats come with a hydraulic lid and seat which closes quietly to reduce unnecessary noises. Some bidet seats have sensors so they will only work when someone is seated on them. The sensor stops any accidents that might come about from children or individuals who do not know how the fixture operates. The aim of bidet toilet seats is to clean the private parts more thoroughly than plain toilet paper. The majority of bidet seat models come with lots of features. Standard models often have one or several cleaning wands which extend from the foundation of the seat and can tackle a number of functions from regular front and back cleaning down to enema functions. A very basic feature though of a bidet is the adjustable water temperature and pressure. To guarantee the best possible hygiene, lots of bidet seats come with a self-cleaning function which washes the cleaning wand with water before retreating into the bidet seat base. The air dryer is excellent for individuals who do not want to use toilet paper to dry themselves after washing. It is convenient for people who are suffering from hemorrhoids who do not use toilet paper because it is too unpleasant to use on their affected parts. The warm temperature of the moderate dryer makes this feature comfortable. A remote control is required if users have limited mobility and are also great for beginners who have never used a bidet seat before. Most remote controls for bidet seats are wall-installed and give users fast access to every feature of the seat. Lots of models with remotes include an installed control panel which is positioned on the seat itself in the event of remote control malfunction. You’ve finally caved in and bought a bidet seat. Now all you need is to mount it. Bidet seats are pretty easy to mount and most of the time you won’t need the help of a professional. All you need are some basic tools and the job can be finished within half an hour. You should first be aware that this kind of fixture is designed to suit just about any toilet available. Most companies make sure that their range of bidet seats will fit toilets without any retrofitting required. Bidet seats are built so they can replace your current toilet seat and attach effortlessly to the toilet. 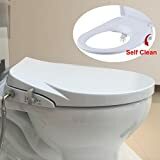 Take away the existing toilet seat by taking the two plastic bolts away which link the seat to the bowl of the toilet. You will find them located underneath the bowl and they can be removed by hand. Remove the bolts completely and take away the seat. Position the bidet seat in place. The holes meant for the plastic bolts that you took away earlier must be aligned perfectly because this is a standardized part of the toilet. If the seat came with new bolts, then you need to use them. If not, the old bolts will do the trick. Secure the nuts in place and tighten them using your fingers. If you want them tightly screwed, you should use a wrench, but don’t overly tighten it or you might damage the plastic. Switch the water valve off which supports the holding tank to the toilet. Unscrew the top pipe using a wrench. The seat must include fittings and a bendy hose that will take the place of the pipe. Link up all components and secure with the wrench. Make use of Teflon tape to guarantee that all connections are tight and secure. Once you are finished with the job, the next step is of course to test the bidet seat. Turn the water valve on and switch your new fixture on. Lots of high-end models come with a remote control feature so you might need batteries for it. If you still need to find a good product, then consider one of these bidet seat models. These products have garnered lots of positive feedback from a variety of customers. Check out what these products can do by reading these short reviews. 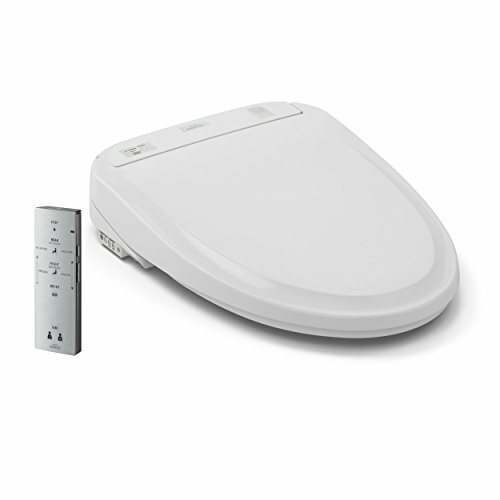 The TOTO Washlet C100 Elongated Bidet Toilet Seat can be bought in two styles and colors. It comes with a dual-action spray that has oscillating features, provides soft aerated, warm water and also includes controllable temperature and volume settings for the water. One great benefit of this unit is that it has a PreMist feature which cleans the bowl before every use so dirt will not stick to the sides of the bowl each time. The model comes with a simple design and includes all the installation and connection items you need. The front and rear warm wash has 3 temperature settings plus 5 pressure options. Meanwhile, the heated seat and air dryer come with 3 settings. The product also comes with an automatic deodorizer which takes away bad smells while the seat is being used. Lastly, it comes with a self-cleaning wand for better hygiene and a soft-close function for the seat. 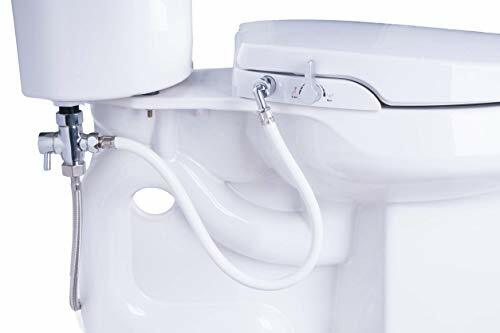 The GenieBidet Seat with Self Cleaning Dual Nozzles comes with a sleek and elegant design which is non-electric so you won’t have to deal with wires during installation or usage. It is fast to install and includes distinctive individual nozzles for cleaning the rear area and for feminine washing. It also comes with a controllable soft-strong spray unit. This is a user-friendly product fit for all ages. One great benefit of this unit is that it offers a superior way to ease and minimize symptoms caused by conditions like hemorrhoids. Hence this is a seat that will accommodate the needs of people suffering from those conditions. The nozzles are self-cleaning and dual retractable as well. It has an ambient temperature spray that improves usage and convenience. The model encourages excellent everyday hygiene and is definitely a recommended product. 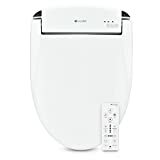 The TOTO Washlet S350e Elongated Bidet Toilet Seat with Auto Open and Close comes with a self-cleaning nozzle or wand to further encourage cleanliness and keep users fresh and clean after using the toilet. The nozzle is adjustable as well so users can choose the kind of spray and temperature they are comfortable with. The product also comes with eWater, which is electrolyzed water for the Premist feature. This helps to keep the toilet bowl clean and hygienic at all times. Another excellent benefit ofthis bidet seat is that it has an automatic open and close lid which perceives movement. It will open whenever a user approaches the bidet and close as soon as the user is finished using it. 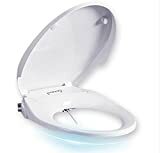 The bidet seat also includes a convenient built-in light which allows users to utilize the seat even in dimly-lit surroundings. The KOHLER K-5724-0 Puretide Elongated Manual Bidet Seat utilizes a confined water stream to provide users with a cool and bracing washing experience. It comes with a modern and elegant low profile appearance which gives users excellent comfort levels during use. The unit comes with convenient features such as the adjustable spray wands and side levers which make using it a breeze. It also includes a Quiet-Close mechanism to guarantee that the seat will close without creating any noise. The seat can be assembled quickly and comes with the hardware needed to set it up. It also comes with Grip-Tight bumpers to give additional stability and prevent the seat from moving. You won’t need batteries or electricity to operate it either. 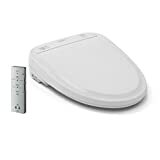 If you want to take advantage of the benefits that a quality bidet seat can offer at a price you can afford, then the SmartBidet SB-2000 Electric Bidet for Elongated Toilets might be for you. While the unit does not have that luxurious feel that high-end models can offer, it does its job very well and at a price that will not break the bank. This bidet seat has lots of features that you can see on more expensive models as well like an air dryer and heated seat. It also includes features like adjustable water pressure and temperature, multi-wash functions and a built-in control panel. This model is one of the most affordable bidet seats available, so if you are new to bidet seats and want to test one out, you can’t go wrong with this model. Just attach it to an elongated toilet seat and you can enjoy the additional convenience, cleanliness and sanitation that bidets are known for. These days, cleaning your privates can be more high-tech and hygienic than ever. 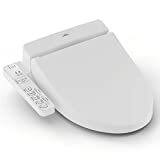 The bidet toilet seat was made to make cleaning your intimate parts easier and more convenient. Bidet seats are a nice invention because they make the whole restroom experience more comfortable, thorough, hygienic and easy, especially for the elderly and people with limited mobility.